Business Events Victoria (BEV) is proud to announce its ongoing commitment to leadership in the business events industry by becoming members of the Association of Australian Convention Bureaux (AACB), the peak body for convention bureaux in Australia. “Our AACB membership brings BEV in line with the other 14 convention bureaux across the country and we look forward to working closely with Andrew and his team to further the business events industry in regional Victoria and Australia,” said Chris Porter, BEV Executive Officer. 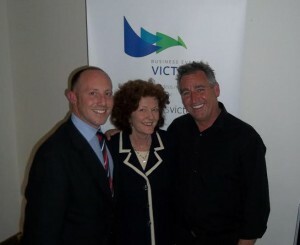 “With the support of the Victorian state government, through the Regional Victoria Business Events Program, BEV has been able to grow its bureau services in recent years, and joining AACB highlights BEV’s vision for quality and reassures clients that they are dealing with a professional bureau,” said Mr Porter. Background – who is BEV? Business Events Victoria (BEV) is a collective group of conference venues, accommodation providers, tour operators, local councils, regional tourism organisations and service providers. BEV’s aim is to market Victoria’s meetings, conference and events industry by working collaboratively to demonstrate the quality and diversity of conference venues, services and settings in regional Victoria. Background – who is AACB? The Association of Australian Convention Bureaux consists of 15 city and regional bureaux, dedicated to marketing their specific region as premier Business Events destinations to intrastate, interstate and international markets. The bureaux also recognise their collective responsibility to promote Australia as a whole. Australian Convention Bureaux are dedicated to assisting organisations to host exceptional business events by discussing event objectives and matching needs with the best facilities, venues and entertainment to meet budget parameters.